Cheim & Read is pleased to announce an exhibition of new paintings by Irish-born American artist Sean Scully. This is the artist’s first solo show with the gallery. The exhibition will be accompanied by a full-color catalogue with an essay by John Yau. Landscape and location have always played an important role in Scully’s working process, and he often titles his works with reference to where they were painted, as with the ongoing series Wall of Light. Greatly impacted by trips to Morocco, Mexico, Australia, and France, Scully finds inspiration in the light and colors inherent to specific places. He currently spends his time between Barcelona, New York, and the Bavarian countryside south of Munich, Germany. He has said that the latter, with its winter-time palette of multi-hued grays and whites, has led to a softening, almost metaphysical approach to his work; the tonality of the eight-part horizontal painting Night and Day, 2012, is an apt example. John Yau, in his essay for the catalogue, also cites the traumatized landscape of Scully’s Irish homeland, its physical scars from the Great Potato Famine cutting visible lines in the hills. In this vein, Scully’s 2013 series, Landline, offers not grid-like blocks, but muscular bands of rhythmic, sometimes dramatic, color. Scully was born in Dublin in 1945, and grew up in the south of London, where his family moved in 1949. He began painting in the late 1960s, and moved to New York City in 1975; he became an American citizen in 1983. 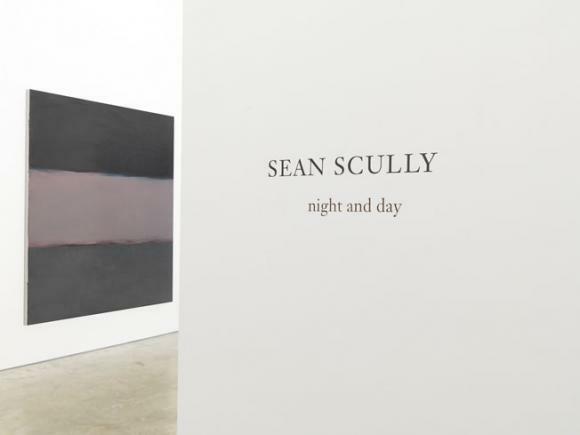 Scully has shown extensively, both nationally and internationally, including, most recently, at the Philadelphia Museum of Art (Sean Scully, 2012-13), and the Lentos Kunstmuseum Linz, Linz, Austria and Kunstmuseum Bern, Bern, Switzerland (Sean Scully: Retrospective, 2012), as well as in in several solo exhibitions in the United States, Ireland, England and Germany. Scully is represented by Cheim & Read. Sean Scully: Change and Horizontals is on view at the Drawing Center through November 3.